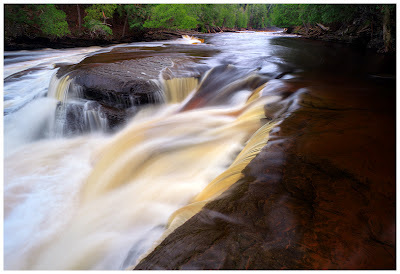 There is a series of powerful waterfalls along the Presque Isle River. Most have been named, but there are a few that still have no name. As far as I know, this serious of falls is one of those still unnamed. I have spent hours researching this area and still have found no information about it. I decided to call it Elegant Falls for its lovely series of flattering cascades. The area is a bit of a risk because the only position I could find to capture it was above a ten plus foot drop surrounded by powerful moving water. This waterfall is located between Manabezho Falls and the Presque Isle River Gorge. It is also one of my absolute favorites from the Presque Isle River in the Porcupine Mountains State Park. I hope everyone enjoys this photograph. If most information about the falls in desired, please feel free to send any questions or concerns to me at my E-mail - jpphotography2@yahoo.com. Technical details: Canon 7D, Canon 10-22mm lens (@12mm), 3-stop neutral density filter, circular polarizer filter, ISO 100, F/16, two image blend, one at 10 Seconds for the foreground and trees, one at 2 Seconds for the bright moving water.